World 7- Airship is the airship level of World 7 in Super Mario 3D Land. The level starts on an airship. The player must then cross a rotating platform to reach another airship segment, then must cross two more to reach another segment. Following this is a series of rotating platforms, with a Magikoopa appearing to attack the player. Another airship segment and several more rotating platforms are after this. On these rotating platforms are spikes and wooden cutout Goombas, as well as Magikoopas. On the airship after this is a Warp Pipe guarded by two Rocky Wrenches; one throws wrenches, and the other, who is in the pipe, throws Bob-ombs. Down the pipe is the boss room, which contains both Boom Boom and Pom Pom. The pipe that appears after defeating them leads the player to an airship with a green + Clock and the flagpole. Star Medal 1: The first medal is found at the start of the level, near the edge of a moving cylinder. Star Medal 2: The second medal is found on a moving red, hexagonal platform. A Magikoopa will appear when the player gets close to the treasure. 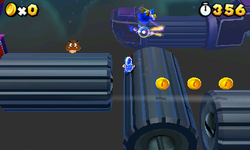 Star Medal 3: Before entering the pipe to fight Boom Boom and Pom Pom, the player should go to the top of the airship, where the final medal is found moving in conjunction with a rotation platform.